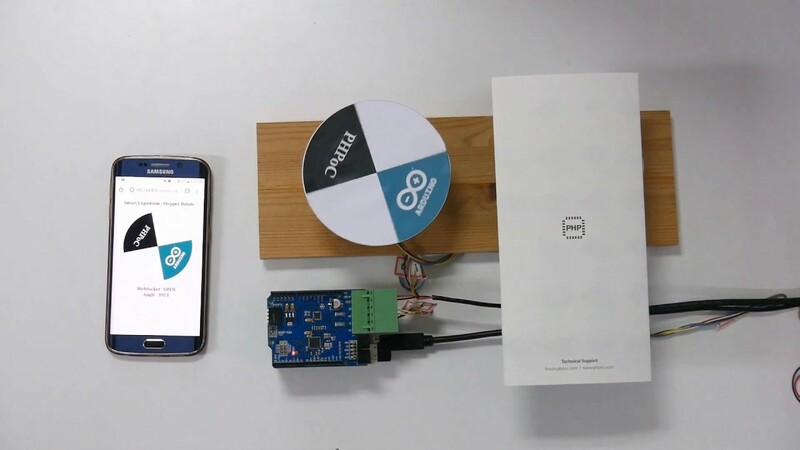 When user access webpage of PHPoC [WiFi] Shield from a web browser on Smart Phone or PC, a WebSocket connection will be created between Arduino and web browser. WebSocket connection allows to real-time exchange data between web browser and Arduino without reloading webpage. When user rotates the plate on webpage, the rotated angle will be send to Arduino. Arduino convert angle to the equivalent number of steps, and then move step motor to the equivalent position. Angle per step: ANGLE_PER_STEP. This value is got from motor specification. This is arduino code, which run in infinite loop. Copy the below code and save it into remote_rotate.php file. Connect PHPoC to PHPoC [WiFi] Shield via micro-USB cable according to this instruction. Note that Arduino must be powered. Last edited by IoT_lover; 12-20-2018, 11:58 AM. All times are GMT+9. This page was generated at 05:20 AM.